How many buttons do you prefer with your gaming mouse? Are you a fan of the two buttons, or do you prefer to have a third middle button? What do you say to a mouse that has 20 buttons? That might seem ludicrous, but the wizards at Logitech have given us a reason to not only use a mouse with a ton of buttons, but to also seriously consider never going back. Logitech’s new gaming mouse, the G600, is designed with massively multiplayer games in mind, and packs an impressive 20 buttons for assigning any hotkey or keyboard shortcut to the mouse. This includes the 12 buttons on the left side of the mouse where the thumb naturally rests, a clickable scroll wheel that also clicks left and right, two buttons below the wheel, and three primary mouse buttons. The real party trick of the mouse is that the third primary button actually functions much like the Control key on a keyboard, in that it gives a second function to the other buttons. Under the hood, the technology is impressive; the mouse has a maximum tracking rate of an insane 8200 DPI (as well as up to 1000 USB reports per second), a value that can be adjusted on the fly to another value if the option is set up. A good example of this is if, during a sniping section of a game that requires more precision, the press of the button will cause the mouse to track with a higher DPI rate, then switch back to resume normal gameplay. The mouse itself feels great. It’s not overly bulky and the plastic shell is molded remarkably well; the time it took to transition from my significantly smaller basic mouse was practically nonexistent. It took slightly longer to not accidentally click the third button while gripping or moving the mouse, but since this button doesn’t have a direct function in most applications, this really was not a major source of frustration. There is a minor learning curve if you’re not used to a mouse that has 18 additional buttons. For the first 20 minutes or so of using the mouse, I did occasionally (and expectedly) hit the wrong button as my hand got accustomed to the new mouse. However, this learning curve does not last long, and by the second day of use it didn’t require any extra thought or effort. Logitech went the extra mile when considering how to make the mouse easier to use for players. Following installation, Logitech’s software immediately detects the mouse’s presence and pulls up individual profiles for a multitude of games. Right in the game’s software, the bindings for games can be reconfigured and adjusted. While the software will pull up a large list of games that are customizable in the software, virtually any program (including applications such as Photoshop, if desired) can be inserted into the software by loading an executable and setting the bindings within the client. Alternatively, you can simply set the key bindings within the games themselves. Occasionally, this alternate method can be mildly problematic; setting key bindings in the Logitech software will prevent them from being set in the game itself. I tried setting some key bindings for Skyrim in the software, then tried to do the same thing in the game itself, only to be told that those keys were “reserved.” It would seem that the key bindings can be set in one or the other, but turning on the profile for one game in the software client locks any extensive binding in-game. Logitech also thought of the smaller things as well; the pulsing color cycling in the G-buttons doesn’t appear to serve any sort of practical use, but it sure does look flashy. Rather than have a pair of buttons on the left side of the mouse for clicking back and forward through a browser, Logitech removed those buttons and relegated Web page navigation to the scroll wheel, where clicking the wheel left or right will travel to the previous or next Web page, respectively. The 12 G-buttons on the side of the mouse are subtly divided into two sets of six, which tilt inward just enough to be easily locatable without having to look. The G600 is designed for use with MMOs. In this respect, it excels remarkably. Playing through Star Wars: The Old Republic and World of Warcraft felt incredibly natural, since I was able to reach any of the hotkeys with my thumb and not have to worry about trying to find them on the keyboard. This came with the surprising added effect of reducing strain on my left shoulder from repetitive motion of moving it around to find the keys, and an overall more comfortable experience for a gamer with a chronic pinched shoulder nerve. 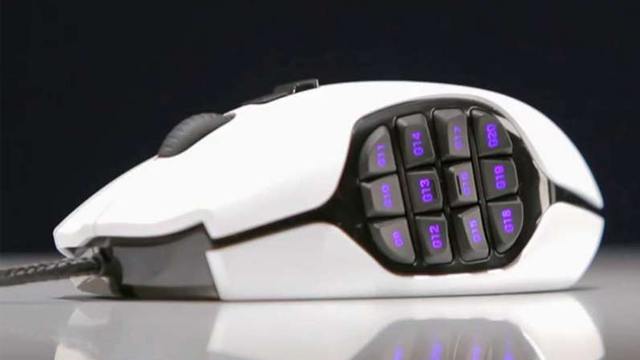 There’s no doubt that the mouse is intended for MMOs, though it can certainly be used for pretty much any other game (and the software did automatically locate several other games such as Borderlands 2, Skyrim, and Torchlight II). Some games really feel great with the G-buttons on the side, most notably the ones that have the skill bar (Torchlight II, League of Legends, etc.) and activating those skills is just a hair faster when they’re accessible directly underneath the thumb. As a proof of concept, I attempted to play Max Payne 3 entirely with the mouse, including movement. As absurdly impractical as that may be, I did manage to get every command in the game configured to the mouse. I’ll never actually play the game that way, but it is a testament to the versatility of the mouse that one could technically use just the mouse to do anything in a game or program. The G600 is another stellar addition to Logitech’s extensive line of peripherals. It looks cool, feels great and is a lot of fun to use. A skilled player with the appropriate dexterity should notice a marked improvement in how games are played, though even uncoordinated gamers could benefit from the mouse. The $80 price point is certainly worth it for a quality gaming peripheral.